The only way you will ever know if you can do something is by trying it! I returned from another week of walking one of the 6 routes of St. James way along the Camino de Santiago last week and I am still buzzing! When people heard I was going to Spain, they presumed I would be wearing shorts and sunglasses to deal with the heat that is so often associated with the country, but not on this trip. On my first ever trip to walk from Sarria to Santiago in 2017, we had a heat-wave. It was overly hot for that time of year, even for the Spanish in the north of the country, walking in the heat can bring its own struggles, but us Irish basked in the sunshine as often as we could - an added bonus to our normal Irish weather. In 2018, also in April when walking this route of the Camino, we had the heaviest of rain, and floods covered many of the tracks, again being Irish and more used to the rain, we plodded on enjoying a different aspect of walking in the rain for nearly 20km each day. 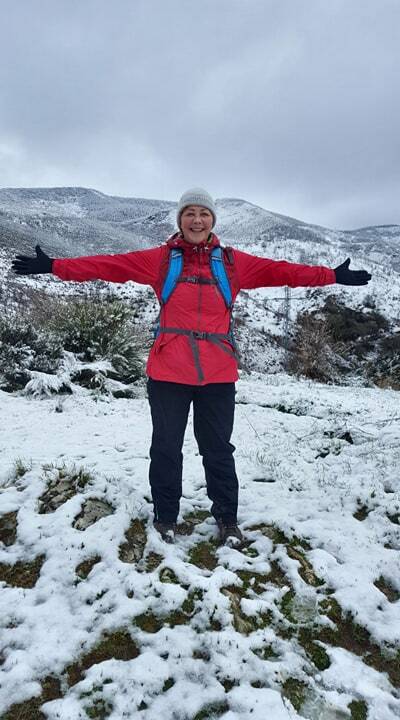 This year, starting on the 2nd of April, we started walking from Ponferrada to Sarria, we had heard rumours that there was likely to be some snow, and from a distance we could see the mountain tops lightly dusted with snow, all very picturesque. On a journey, we seem to always want to know what is ahead of us, but for me, I like to be surprised along the way and by God were we surprised! For the first few days, we had normal weather, in that it was cold starting off, a hint of sunshine broke through the clouds in the afternoons and the evening temperatures dropped once the sun went down. The walking was made easier by the beautiful sights of little villages, trails of vines grew either side of us in many parts and meeting people was always greeted with ‘Buen Camino’. On the day we walked from Herrieras to O Cebrerio we could see the large mountains in the distance that we were about to embark upon. I was excited at the thoughts of walking on a snow covered mountain and feeling the crisp air on my face. We started off with slight inclines which meandered into a forest trail that grew steeper as we walked. The sounds of the birds in the trees and the sunlight breaking through the morning sky created dancing shadows on my path, it made it feel like I was the only one there in that moment. I could see and hear my group just behind me, but for just a few minutes I took some time to just be present and absorb this earthly wonder. It also gave me time to breathe again, when you are walking up hills, you are focusing on keeping a rhythm to your steps and your breath. Sometimes you forget to do both! After walking the first few kilometres, we are so grateful for the small cafes/casas that are nestled in the moutains, greeted by warm ‘olas’ and a café con leche. Removing some of the our outer layers and hats, we look like all the other travellers - everyone has hat hair, so you fit in well. There is a sense of community with other walkers, as they too know what you are feeling as you take this journey of miles for whatever reasons. Some are doing it in rememberance of a loved one who has passed, some are doing it as a spiritual journey to find themselves, others maybe for religious reasons and see this as a pilgrimage, for me it is about opening a gift every day and allowing the journey to fill my senses with sounds, sights and new people. It has become one of the greatest experiences of my life in that I realised after my first Camino that I am stronger than I had once believed, both physically, mentally and emotionally. Plus I love all the fun we have and get to go dancing the odd night! I also do it each year to fundraise for a local group in Tuam who have Multiple Sclerosis, I have had the privilege of facilitating mindfulness classes for them the past number of years and they all inspire me to be my best self each day and to be so grateful to put one foot in front of the other. After our coffee break, everyone is eager to get back on the move and see where our next steps will take us, we headed up higher into the mountains and the sights that greeted us were like a picture postcard. Snow everywhere, the sky vibrant blue with clouds that looked like marshmallows and the air so crisp, as you breathe in you feel it is almost cleansing you. It really feels like a piece of heaven, whatever that is to you, but for me it was the peace and serenity of standing in nature having walked to get somewhere so beautiful, every step was worth it. The further we moved up, the heavier the snow became, snow drifts on either side of the trail and the sharp wind started to hit your exposed skin with a bit of a bite. This was nothing compared to the next day, we started with heavy snow at the start of our trail and the Spanish must have thought these crazy Irish people couldn’t possibly want to walk in the blizzard! But we did. I must admit that I was a little anxious starting out as we couldn’t see very far in front of us, but it also excited me as it is something I have never done before and we were safe in the hands of our guides from Into the West Adventures. who organised our hotels, bags being transferred every day, guiding us every step and generally all round looking after us in any way they possibly could. I sent a photo to my friend as we walked and she said we looked like we were on the run! Faces covered where only our eyes were peering out, but as the morning went on, we even had to cover our eyes as the hail was so big, it was hitting our eyes and making it hard to keep them open. The sunglasses were taken out of the bags after coffee as a protection tool from the hail and snow. It was exhilarating. It took all your energy to keep walking and to focus on your next step. It really made me mindful of the people in front and behind me and also to watch my footing in the snow covered ground. But like most Irish, we found humour in it and even sang whilst we walked, chatted and laughed often. By the end of that day we were all exhausted, we had come down to Triacastela - our final stop for the day and it lashed rain, so now we were soaked to the skin and looking like drowned rats. But you know what, we still smiled and the conversation over coffee, wine or a brandy that day was one of achievement. The group consisted of all ages, we are fit, but maybe we could have done with a bit more training (as we say we will do every year) but we did it! I looked around the table at my fellow walkers and felt so proud to be with them all. We all struggle at times along the trail and today was one of the toughest, but we made it. I’m not going to give you a day by day account of the whole walking week as I could truly write a book on all I experienced, not just in sight and sounds, but in my thoughts and feelings. The Camino is a journey of a thousand steps (if using fit bit it will tell you exactly how many thousand a day!) but I don’t really need to know the number of steps I did, for me it is about knowing that each day I step out into the morning air and take that first breath, that the beauty of our world is there to be seen and only by taking time to explore it , will we truly see it in all its glory. When doing this, you allow yourself to be present in each amazing moment, there are times when you feel frustrated or sore, but you breathe through it, you get help from a fellow walker, whether it is in your group or a stranger that starts to chat as you keep each other company along the way. Many stories are shared with each other, sometimes tears, but always lots of laughter. This trip like the other 3 camino trips I have done always remind me that I can achieve anything I set my mind to. I love the laugh, going out for dinner in the evenings with the group, having a few glasses of vino and sealing the day with shared stories , it seals the day with stories of loo stops in the bushes to listening to the people that have so much more to them than just what we see when first meeting. It’s the fact that I am out of my comfort zone and no matter who I am with sharing this experience, there will always be a special bond, even if you just chat with them for a few minutes or spend the week chatting along the way. We have shared an experience that has pushed us and we have pushed through it. We are constantly limiting ourselves with “I can’t”, but when I am on the Camino, I hear myself saying silently “I CAN”, it is my mantra on a daily basis. The more we arm ourselves with the right words in our minds, the better equipped we are in dealing with all challenging situations, not just on the Camino. For me it has taught me valuable lessons about myself. I can do things on my own, but I do like the support of others. I like peace and quiet, but I also love the laughter and chatter of people around me. I don’t always have to put on a brave face for others and it is okay to say I am having a tough day. I read many signs along the way, hand-painted by fellow walkers and it always gave me a lift. We don’t know what is ahead of us on the Camino or in life, but along the way we can make it a little easier for ourselves and others by being more compassionate and kinder. Everything in life starts with just one step and we can only do it one step at a time.